“A breath of fresh air on the front of ultra-slim players” or “prompt Korean counter at new iPod Nano” – I’m most positive, these epithets were said, unofficially of course, about the new Samsung’s flash player announced at CES in Las Vegas a bit more than two weeks ago. The player got K3 index, being the second model to get into this line-up (the first one was the YP-K5). Those among our readers who are keen on watching all latest and greatest videos of popular bands on TV or on the Net have surely spotted the K3’s predecessor, the YP-K5 in Black Eyed Peas very own Fergie’s new clip – product placement is seemingly capable of something more than just Hollywood blockbusters. The newcomer’s design ingenuously follows the lead of the concept laid in the foundation of the K5 – in fact the K3 is the K5 we know, yet which lacks speakers and packs its functionalities in a tad slimmer and more pocketable casing made of plastic instead of magnesium alloy. The device utilizes already proven touch controls, which put it in the same boat with LG Chocolate (or Samsung Phantom) looks-wise, according to our mini focus-group. Before long, though, thanks to hidden touch controls getting more and more hype around them, such comparison will become a thing of the past. The K3’s form-factor is nothing new for the up-to-date slim flash-powered devices, in other words we have a vertically laid out shell with a display topping player controls. In terms of functionality the K3 doesn’t lag behind its primary rival, specifically iPod Nano 2G, too much. 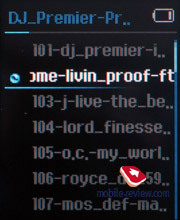 This player does well with playing back files recorded in most widely spread formats, allows for viewing photos and reading text and can seamlessly pick up FM radio signal. A bundled microphone is missing here, so that a Sound Recorder is not on the K3’s spec sheet. Ultimately, this latest and greatest player closes in on Samsung’s current flagship, namely the Z-Metal (Z5) in the sense of the technical talent, and we are quite confused to see two competing models in the range of one company, but it may happen, although, that as the time goes by, the Z5 will move over in favor of a couple of K-labeled models. The K3 comes bundled with 2, 4 or 8 Gb of memory, which is not a surprise, bearing in mind the manufacturer’s more than just robust share on the flash-memory market. The K3 and K5 have much in common, judging by their hardware- and software-related highlights. 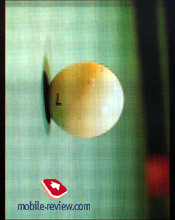 The K3 makes use of a rectangular in shape casing made of back plastic, which is edged by a chrome-coated insert increasing overall durability and sturdiness of the player’s shell. The polished finishing of the gadget’s face looks eye-candy, and we mean that – when the K3 makes it to the shelves of retail stores it will be a truly magnificent item over there. However there is always a price to pay for the beauty – this surface is extremely prone to fingerprints and smudge, even the back panel suffers from the same illness, while it seemingly takes advantage of more matte plastic. 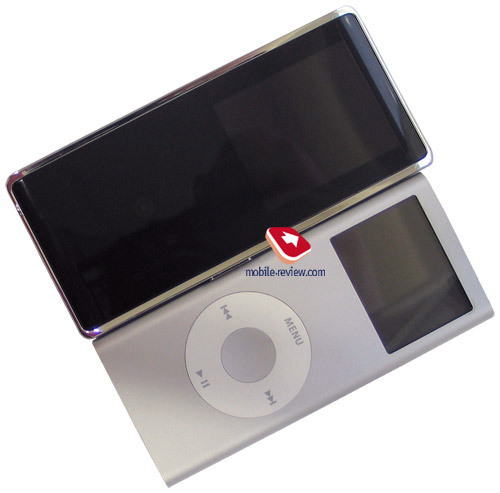 Besides popping up flash-backs concerning the touch controls, the K3 is much like iPod Nano 1G in terms of casing design, so we pin all our hopes on the Korean engineers now, as we really would like to find out that the plastic used here is more scratch-resistant. The display’s cover is pretty dark, or I should better say “tinted”, so that standing only a few meters away you would never tell that this gadget has any controls on its all-black face. Captions of the keys get visible only with the player turned on, while on a shut down unit only the most persistent of you will spot them. The rear plate is left completely bald, just like the top end and the left side are. On the right is the hold toggle doubling as the power button at the same time. And finally, looking at the bottom reveals a full-size audio jack (mini-jack 3.5 mm) and a proprietary USB socket. The casing’s build quality is as always high and can’t be complained about at all – despite being all that thin, the K3 doesn’t leave an impression of a fragile gadget, like Nano 1G did, for example. And even if you put some effort into it and grasp it, the K3 won’t ripple or shock you with another crackling noise, so feel free to carry it in jeans’ front pocket without bothering about taking two halves of the device out of it after a busy day. In all fairness we should note that the K3 is a tad thicker than Nano 2G, bringing to the table 6.95 mm against a barely-there 6.6 mm of Apple’s offspring; but it’s an altogether different story now, since these are tenths of millimeter that count. 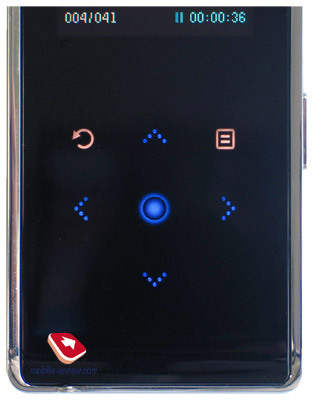 At a glance the player sports an austere and somewhat cold design – the developers picked the path of combining back and silver colors in the device, which has led to the fact that the K3 looks fitting in its owner’s hands regardless of his/her dress code. On top of that, its looks gets along with third-party headphones pretty well, which is not a minor advantage at all, and among all other things, it doesn’t seem to be an outsider when placed next to other portable gadgets. 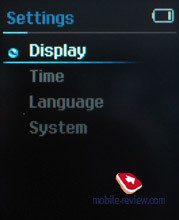 The player’s face, slightly below the screen, are sever touch sensitive pads, with two of them allowing you to go one step back in the menu and call up the contextual menu respectively. Finally, the five remaining buttons make up a classic five-way navigation pad and serve for browsing various menus and lists, volume adjustment purposes, item selection and other functions. 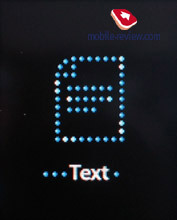 The sensitivity delivered by the buttons is pretty good, but at the same time doesn’t go over the critical line when it becomes a major problem, so here Samsung has managed to stick to a sort of golden mean – naturally, wrong presses do occur, but the longer you play around with the K3, the fewer their number get. Speaking of the device management system, it has remained pretty much the same and bases off time-proven solutions implemented on a touch-sensitive plate, though. You will spend no time on getting used to it, nor will keep looking up for basic tips and tricks in the User Guide. Compared to the K3, the display found on the K3 has gotten a tad larger, measuring 1.8” diagonally against 1.7” we saw on its predecessor. But both the technology powering the screen and its resolution have been left untouched – these are still OLED and 128x160 pixels respectively – which make for crisp, bright and overall brilliant picture and being placed on the black frontplate it is sure to be an eye-catcher. 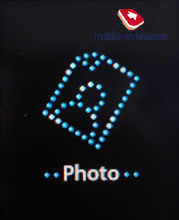 And over at Samsung they took account of that when they were filling up the background for menus and lists on the K3 with black, thus you always have a feeling that icons on the screen pop up from beneath, as if the display took up the entire face panel. The player’s menu is laid out horizontally; all items in the list are displayed as huge detailed icons. But despite being this sketchy and one-colored as well, all icons look incredibly stylish thanks to a perfect match with the casing’s color scheme they make. Even though they are not animated, they easily make up for that by gradually fading and appearing (I would even say “flowing into each other) when you navigate through the menu, which is indeed beautiful and somewhat fascinating. 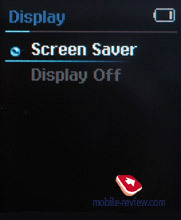 Over at Samsung they have stuck with the justified and time-proven way of making up the interface: if they managed to come up with an appealing visual and technical solution once, there is no point in going for something else on the successors, enhancing it makes much more sense. 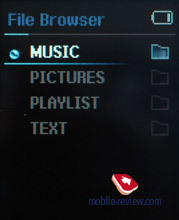 The menu consists of the following items: Music, FM Radio, Photo, Text, Settings. 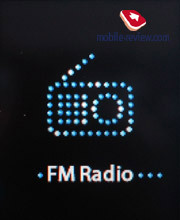 Music, FM Radio, Photo, Text. 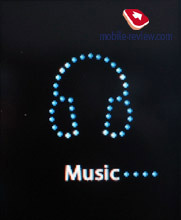 These items stand for music playback mode, FM-radio mode, photo gallery and reading texts on the screen respectively. Settings. Here you can pick the wallpaper, backlighting time-out, menu language and set up system time. In this item you can also manage some system settings such as key tones, reset the player and check out device information. Alarm section, that made all the difference on the K5 since it had built-in speakers, is missing on the K3. 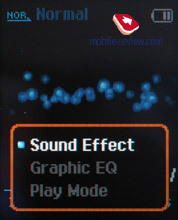 Settings for each mode, say, random playback, sound settings, frequencies selection and so on, are found in the contextual menus that can be brought up by user. 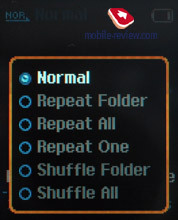 Some will certainly find this approach handy, but there are people who have already gotten used to a sole settings menu and the first thing they’ll do is try to find them all in the corresponding menu item. Personally, I find the former layout more appealing, but as they say - no two minds think alike. On the whole the player’s menu is laid out in a logical and intuitive fashion, not getting-used-to is required. I also have to give a credit to the developers here, as the interface design stands out in the “mainstream” in the finest sense of the word, and is obviously one of the K3’s major strengths. Such succession of solutions applied in the company’s models is the thing we would like to see more often. The role of power supply in the К3 is played by a built-in Li-Pol battery. 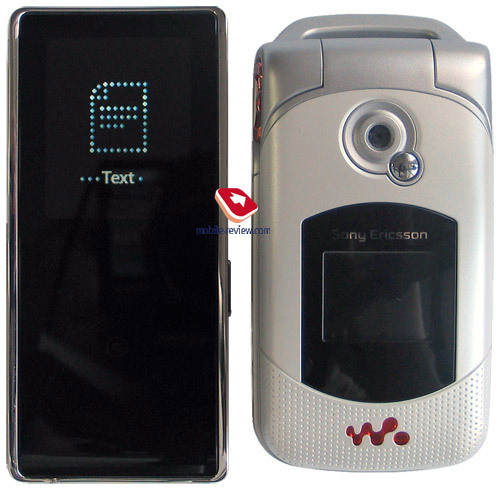 Since this model still hasn’t the dust of the stores’ shelves and words of press-releases settled on it, there is no reliable data on its capacity or even the player’s specifications – this holds true for Samsung’s US division as well, where K3 was launched in the first place. However we managed to find them in the User Guide shipped with our unit on the CD, so with the output voltage the figures are 500 mAh and 3.7 V respectively. Claimed lifetime on a single charge is nothing to shout about, making only 20 hours – although it may come, just like it was with the Z-Metal, when after upgrading the firmware the player had its lifetime boosted by 1,5 times. In practice the results acquired through real-life tests are close to the stated figures – partly charged K3 seamlessly lasted 15 hours on active menu browsing, music playback at full blast and occasional look-ups in text files. Connection with PC is done via USB, but unlike the K5, identified by the operating system as an MTP-device, this one carries UMS-firmware onboard, meaning that you will have a removable drive popping up on the desktop, in other words for transferring music and graphics onto the player default means provided by the OS are used, thus the K3 may be synchronized with any PC, so you could share its data, or get more without any hassles. We are truly happy with Samsung going into UMS, which is all the right move in Russia, while there is a chance that for many other countries the K3 will come pre-installed with MTP-firmware forcing you to turn to a software manager. Nevertheless for the Russian consumers, who have no strong preference for copyrights, lack of necessity to delegate music handling job to a piece of software is utterly handy. To me, this is what makes all the difference (in a positive way) between the K3 and iPod Nano or Samsung Z-Metal and the cutting edge that will enable it to hit considerable sale rates in prospect. No wonder that the sound quality for this player is not a letdown – on the contrary, it is pretty much on the top level, thankfully, the K5 put up some good performance on this front. With good ear-plugs the K3 sounds penetrating and powerfully, carefully outputting even the lowest frequencies. The amplifier here has pretty high output power, making up 20 mW per channel and boosts nearly each and every in-ear headphones and most of clip-on headphones. Foreign sounds and overtones at top volume level are absent – we put the K3 thought its paces with KOSS Porta Pro, The Plug, V-Moda Bass Freq, and default iPod headphones, but didn’t figure out any “favorite” style of the player, ultimately, any music, from rock-n-roll to drum-n-bass, sounds pretty good with it. 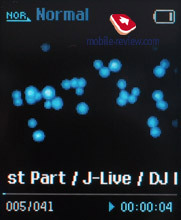 Frankly, sounding and the output power of the K3 are akin to those of iPod Nano 2G – in act these players share Samsung’s platform and I wouldn’t be much surprised to find out their circuitries having much in common. Sound can be set up and adjusted by picking one of the presets (Vocal, Bass Boost, 3D Sound, Concert Hall), manual setup is not included. The FM-tunes doesn’t sport any newsworthy functionalities, saving for its RDS support. As always, you can go either for auto or manual tuning, the number of free slots for radio stations makes up 30, which is quite enough to get all favorite bands into the K3 and still have some to spare. On top of that you can just scan the entire frequency range and forget about ever having to look for required stations again, unless there are some new “Radios” over there. Even though the journalists have already gotten tired of find off Nano and newcomers claming the title, Samsung K3 seems to be a serious bid for victory, at least in the countries, where Apple’s solutions are not dominating, like in the US. As for the Russian market, here the K3 will come out on top thank to being locked to a sole file manager (support for Universal Mass Storage, UMS) and having a price which is on a par with its rivals. Due out in March for the European and Russian stores, Samsung’s latest offspring will be retailed for approximately 170 USD for 1Gb edition, which even cheaper than the long-lasting member of the sales charts, the Z-Metal, or the Z5. 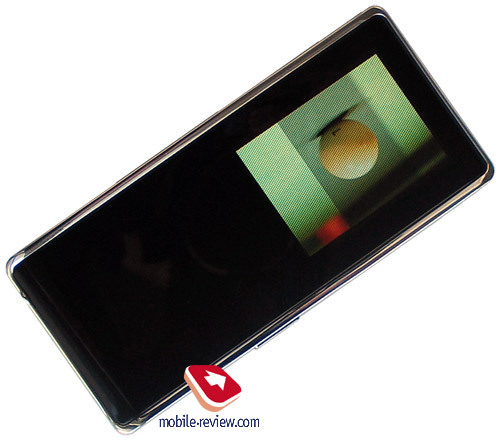 And it is not the only thing where the K3 does good at – the rest of its specs aren’t a disappointment either: crisp display (better than that on the Z-Metal), penetrating sound, slim casing that falls only marginally short of the market’s best offerings. But even with its fetching design, the bout against the 8Gb Nano will be tough for the K3, as the Californian all-black music box has much of a winner in it. Generally, the K3 fits the position of Nano’s main rival on the Russian market way better than the Z5 that somewhere was dubbed as the one and only Nano-slayer, even though both consumers and journalists are sick this title already. At last Samsung has equipped its player with a one-piece design, meaning that the device is taken only as a comprehensive whole, so that your eyes won’t stick to one concrete detail anymore. Besides, touch controls found on both the K3 and the K5 are by no means Apple look-alikes and on top of that are superior to that “touch-sensitive wanna be” embedded in the Z-Metal. Bluntly speaking, this player has left a very favorable impression to, maybe, not the most zealous fan of Apple’s products, but still, it pleased me, which is much already.